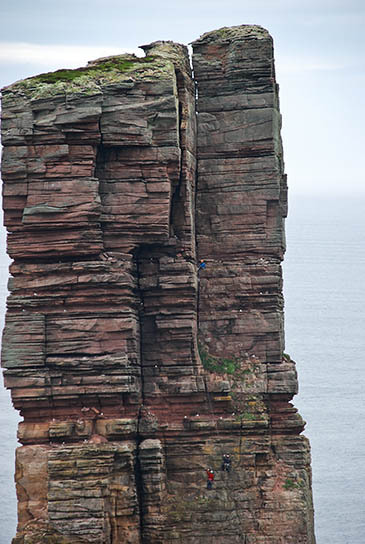 The man who claimed the record as the first blind person to climb an imposing Scottish sea stack has spoken of his experience. 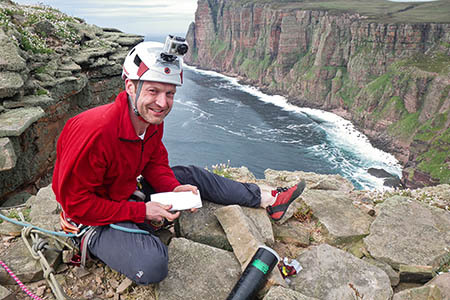 Red Széll said his climb of the Old Man of Hoy in Orkney was a 30-year-old dream come true. The 41-year-old househusband, who has also written a thriller novel, summited the 137m (449ft) stack first climbed by Chris Bonington, Rusty Baillie and Tom Patey in a live television broadcast in 1966. He accomplished his climb with help from Martin Moran and Nick Carter who made the ascent with him. Mr Széll, who has retinitis pigmentosa, said: “From the moment I grasped my first handhold on the Old Man I forgot that I couldn’t see. “My fingers and feet sought out the cracks and features, following the natural lines of the weathered rock and guiding my way. “The odd correction came from Nick at my side if I was going off-course, or about to smack my helmet on an outcrop or overhang, but otherwise I was focussed totally on getting to the top. “About ten minutes from the summit, when I came to the cleft that splits the wall in two, the sheer natural beauty and presence of my surroundings hit me and the realisation that I was about to make a 30-year dream come true. “Had I not begun to go blind I’d never have had the impetus to make my dream a reality. Had I not started climbing again I might have remained wallowing in my loss and never gained such an amazing experience. Money raised from Mr Széll’s challenge will go to gene-therapy research at Moorfields Hospital. He learned to climb in the 1980s while at school, tackling routes at Swanage and in the Brecon Beacons. After moving to London he said he got out of the climbing habit until he rediscovered his passion for the sport at climbing walls. He has topped his target of raising £10,000 for the charity, with his justgiving page bringing in more than £11,100 at the time of writing. 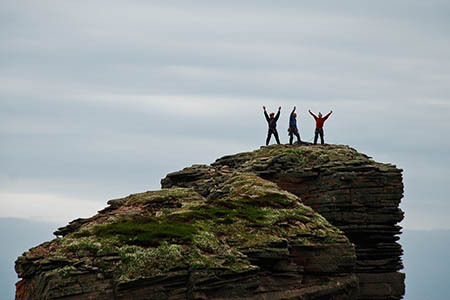 The climb was filmed by Everest summiteer Keith Partridge for broadcast by BBC Scotland later this year in The Adventure Show.